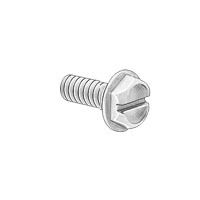 Serrated and slotted hex-washer-head machine-thread (MS) screw, #8 thread pitch, 3/8-inch length. Used on many devices in Data East, Sega, and later-model Stern Pinball games. Replaces obsolete # 237-5821-00 and # 237-5975-00.